Missy Chase Lapine is best known as the creator of the wildly successful Sneaky Chef series of books, including her first, a New York Times bestseller, The Sneaky Chef: Simple Strategies for Hiding Healthy Foods in Kids’ Favorite Meals (Running Press, April 2007). Missy’s second book, The Sneaky Chef: How to Cheat on Your Man in the Kitchen, was published in April 2008, helping to lower cholesterol levels across the nation. Her third book in the series, The Sneaky Chef to the Rescue (April 2009), was inspired by her passionate readers and their special requests. Missy's latest innovation, Sneaky Fitness, (co-authored with fitness expert Larysa DiDio) cleverly instills the love of movement and fitness in kids. It hit the shelves in January 2010, and has topped children's fitness lists. The Sneaky Chef and Sneaky Fitness books have inspired not only families around the country, but have established a whole new healthy eating and lifestyle brand category. Missy is a member of Parenting Magazine’s team of experts, the “Mom Squad,” a panel of high-profile experts who are featured regularly in the industry-leading magazine. She has been a cooking instructor at New York’s finest culinary schools, and also serves on the Children’s Advisory Council of New York-Presbyterian Morgan Stanley Children’s Hospital, where Sneaky Chef recipes are served to patients. Sneaky Chef exclusive prepared foods are also featured and sold at select Whole Foods Markets. is made from naturally sweet and "nutty" tasting golden peas. It is a delicious peanut butter alternative, without a trace of peanuts, tree nuts, seeds, or soy! Enjoy! I'm the Sneaky Chef, known for hiding healthy veggies in everyone's favorite meals. I can't wait for you and your family to try my new line of delicious No-Nut Butter! They've got all the taste of peanut butter - without the peanuts! Parents love these nut-free spreads made from a legume - golden peas - a variety of garden peas that are sweet, naturally nutty tasting and packed with vegetable nutrition. Kids love the "peanutty" taste. Smooth texture, "peanutty" taste, no nut allergens, great for nut-free schools. Get ready to experience the taste of a PB & J again! All Non GMO Ingredients: Yellow Peas, Canola Oil, Powdered Sugar (contains Tapioca Starch), Palm Fruit Oil, Salt, Mono- & Diglycerides (Vegetable Source), Cocoa Powder, Natural Flavors. CONTAINS PEAS (LEGUME) - 16 oz jar. The classic taste of chocolate and peanut butter, without the peanuts! Enjoy a bit of indulgence, without fear of nut allergens. Good straight out of the jar or spread on almost anything! Ingredients: Non GMO Canola Oil, Non GMO Yellow Peas, Sugar, Cocoa Powder, Palm Oil, Salt, Mono- & Diglycerides, Natural Vanilla. CONTAINS PEAS (LEGUME) - 16 oz jar. 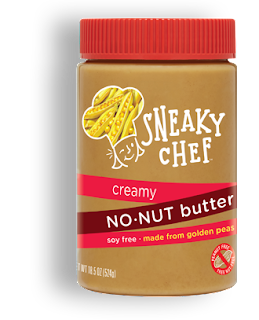 The Sneaky Chef No-Nut Butters are delicious! My kids and I absolutely loved the chocolate and creamy flavors! I love that these are nut-free because it seems like so many kids these days have peanut allergies. I also love that they don't contain any high fructose corn syrup, hydrogenated oils, artificial colors or flavors. They're also Gluten free and come in a BPA free jar. Our favorite way to eat the chocolate is straight out of the jar or on apples. The creamy is really good on apples and is my kids favorite afternoon snack. I'm amazed how how great these taste considering they're main ingredient is yellow peas. What an awesome way to get kids to eat healthy! 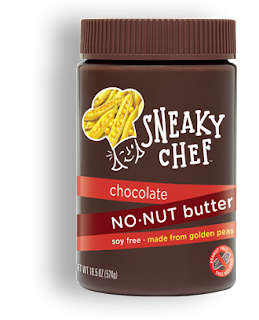 Click HERE to locate a store near you that sells The Sneaky Chef! Click HERE to learn more about The Sneaky Chef! Follow The Sneaky Chef on social media!